Maybe you've seen some of the newer branches (Grotto->River->Maelstrom) and wondered where they were leading to? Well here's the answer. 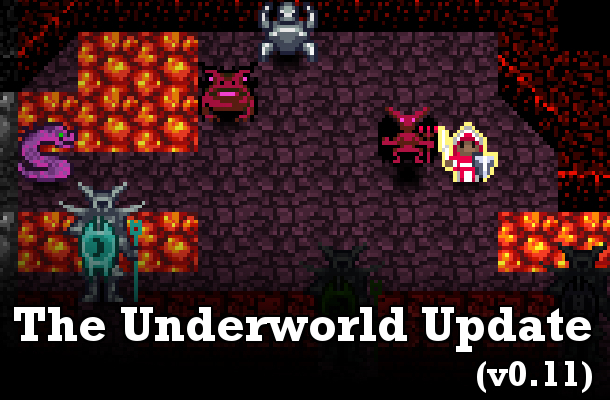 This update introduces the UNDERWORLD, an infinite series of levels filled with ice, lava, demons, procedural monsters, the craziest boss fight in the game, and pain. Lots of pain. The central set piece of the Underworld is a fight involving Fire Mother, Ice Father, and 7 Demon minibosses (one for each day of the week). I don't want to spoil anything, but I'm super excited about this encounter. 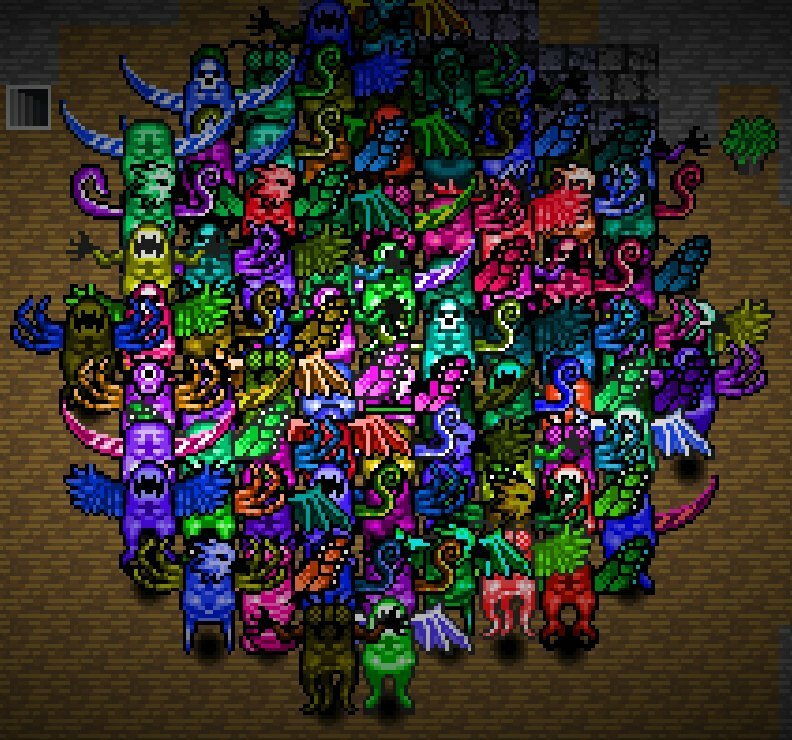 And that's not counting six new demon monsters. Highlights include the Demon Ghoul which only attacks when you're injured and the Demon Viper which can poison/confuse/delude you all at once. Unsurprisingly, demons drop "demon blood", which can grant demonic abilities and heal you, even above max HP. Lastly, the coolest part of the Underworld is that it goes on forever. In each level after the first you'll find a Baron, a randomly generated boss. These guys have random attack types, resistances, spells, and even sprites! To give you an extra leg up, each collectible ring now has powerful effects. Collecting them will be crucial to surviving the horrors of the Underworld. A new class has been added. In a departure from the typical design, the Light Mage has a permanent effect: your character always glows. Stealth is nearly impossible, but several areas of the hotel become easier to navigate. This class also starts with a Celestial Essence (probably the most powerful potion) and a brand new spell, FOCUS. Other changes include more satisfying enemy deaths, new sound effects, some tweaks to the Fane encounter, and several bug fixes. New branch, UNDERWORLD, which is reachable from red portals in the Maelstrom. Morgue files are now uploaded automatically with an option to turn off. Please let me know if this a problem for you. Lava and Ice tiles added. Demon blood can now heal above max HP. This change is a buff for one of the existing classes (wink, wink). Monsters sometimes drop gold on death. Let me know what you think! I'm very curious how people think the Underworld is balanced. One last reminder that the price increase to $10 is coming in a few days. what a update 0.0 ! What are you trying to do, win Roguelike of the Year? Thumbs way up! Keep up the good work.